GM launched the Sonic in late August. The company sold 3,833 Sonics in October in the United States, GM reported today. DETROIT -- A parts shortage will halt production for at least two days at the General Motors plant where workers assemble the recently launched Chevrolet Sonic subcompact, GM told workers today. Workers at the Orion Township assembly plant in suburban Detroit were told to stay home today and Wednesday because of the unspecified shortage, according to a message recorded on an emergency notification hot line. GM spokesman Chris Lee declined to say what part was in short supply. “We are working with the supplier to resolve the shortage,” Lee said in an e-mail. The phone message for employees said normal production is scheduled to resume on Thursday. GM launched the Sonic in late August. The company sold 3,833 Sonics in October in the United States, GM reported today. 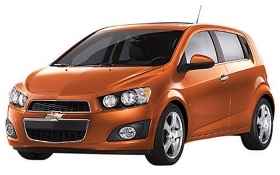 The Sonic replaces the Aveo, which had U.S. sales of 6,038 in October 2010. About 1,500 people work on two shifts at the Orion Township plant, which reopened this year after being idled in 2009 amid GM’s bankruptcy-related cost cutting. GM is using a higher percentage of parts from overseas -- primarily from Korea -- and is making broader use of in-house suppliers to boost efficiencies at the plant. About 40 percent of Orion Township’s workers are so-called Tier 2 workers, making an entry level wage roughly half that of regular UAW employees, part of a 2009 agreement that helped GM become the only automaker to assemble a subcompact car in the United States. Other automakers make small cars in countries where labor is far cheaper, such as Mexico. GM also has begun building pre-production versions of the Buick Verano compact at Orion Township. That vehicle is slated for a December sales launch.